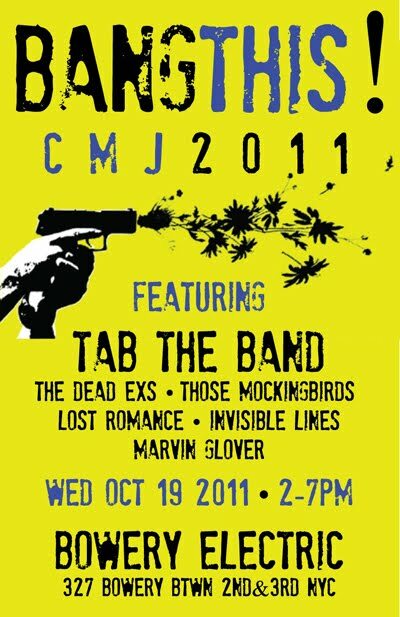 Guitar fans, mark your CMJ calendars! If you like things on the guitar rock side of things, the Bang This! 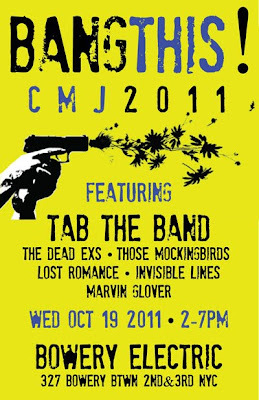 CMJ Music Marathon show is the place for you to be. Swing by Bowery Electric on October 19 to catch a rockin' line up. Details are below! BANG THIS! A DIT (Do It Together) self-organized collective of Tri-State Area labels, bands, and music media outlets will be held on Wednesday, October 19th 2011 at the Bowery Electric in New York City in tandem to the CMJ Music Marathon & Film Festival. BANG THIS! celebrates the DIT “strength in numbers” credo helping new bands to spread the new roots of alternative rock & roll by teaming together and embracing the return of the glorious guitar that still champions the world of rock! There will be a total of 5 solid hours of music from revivalist garage blues to modern alternative rock at this rock & roll matinee.